It drives us to invent, to improve and to race our fellow man to ever greater heights – not just in destruction but also in infrastructure and perhaps most of all, in communication. Since even before the war banners of the structured regiments of the medieval period, the need to clearly, yet covertly, communicate with one another has driven ever more sophisticated methods of doing so. Many of these innovations have since gone on to improve the lives of the general public as well. In EVE, as in war, the need to clearly and quickly communicate between members is paramount. At the heart of this need, and in every fleet, sits an FC. The FC watches the information pour in, both through their own interface and the comms. The FC’s job is to own the communication throughout the fleet. The goal of the FC is to form the very thoughts of their fleet members. To do this they must use every tactic available to communicate clearly, directly and without confusion… exactly what is expected. Because of this, many FC’s can fall behind in being a normal functional member of the team. With so much going on, FC’s are more likely than most experienced players to be out of position, not attacking, or attacking the wrong target. This problem is compounded by the fact that the complexity of fleet fights has increased significantly in the last year. What once was simple overview watching, now has FC’s require a 3D understanding of the overall space of the fight. Even the most talented FC’s become frustrated that they are effectively giant linchpins to the fleet, a fact that can and is exploited often in a war where your enemies never truly die and never forget. The notion of the “anti-headshot” FC ship is one that has been kicked around in FC circles for quite some time, but this year at Fanfest CCP Fozzie put it on the map. 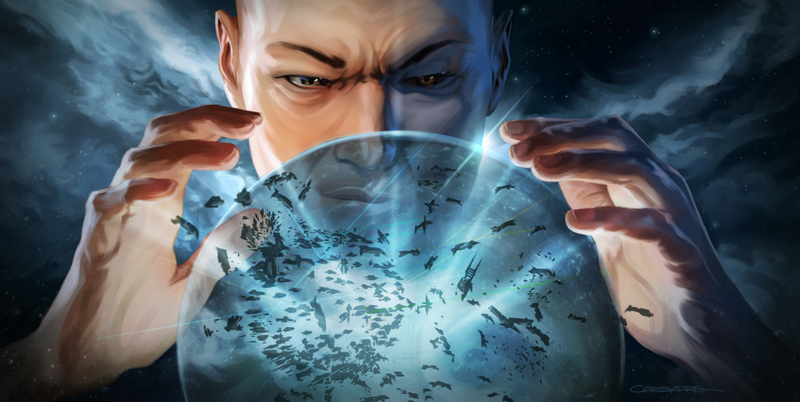 CCP is driven to create the best experiences they can for EVE and they realised that while fights in which the FC is simply headshotted is an advantageous strategy, it ain’t much fun. The act of targeted removal of the brain of a fleet is so disruptive it nearly guarantees ‘cancer’ levels of popularity at all levels of play. This second part is even made worse by the fact that with a spatially aware battlefield, it is hard to communicate vocally and so FC’s have to be the anchor for the DPS ships, singling them out. This problem becomes even greater when FC’s, who arguably are the glue that holds most of EVE together as a game, begin to stop using specific strategies or even quit FC’ing altogether in frustration. FC’s and their survival are essentially required for good, engaging, prolonged fights. FC’s also are often less functional than their members either do to distraction or to having to sit in super-tanked ships to avoid headshots. Invincibility is super strong. As we discovered with the PANIC module, this can have unintended consequences. A new type of Command Cruiser that cannot use a micro jump drive but can use an Expanded Probe Launcher, along with a new high slot module: the micro-PANIC. This new module only protects itself and doesn’t burn out, but it does last five minutes. This means that a FC can use it to lock themselves down and make them immune for the time period. The ship cannot activate any other high slots while the module is cycling, leaving it’s only real offense potential in non-bonused ewar. The cycle time means that an FC that loses a fight has to sit there as the enemies watch, however this still isn’t great. Thankfully we have a better answer. Thats right, I am bringing up hacking in combat again. Back in the long, long ago when we were discussing combat probing and such I argued that hacking could be used to disrupt off grid boosts. Thankfully, CCP came up with their own perfectly reasonable solution and the idea was not needed. However, the drive to have hacking be something that is functional as a productive thing you can perform for your team, as opposed to just a minigame for loot, has been strong for as long as the hacking has existed. Here we have an interesting opportunity. Let’s say the micro-PANIC beacon has five redundant Cores. Every time an enemy successfully hacks your ship using the standard hacking mini game, you lose one Core. Once they all are down, the shields go offline and you are vulnerable once again. Allow the ship to see that they are under attack, by who and how many Cores they have left. You can also add a new low slot, module that will add extra Cores. This would be very dangerous to do in an active fight, as you have to stay within 5km of the target you are hacking. Failed attempts just abort. As a bonus you could add this feature to the full sized PANIC module, maybe with some extra Cores, just to give that gameplay a bit more burn. But what will the FC’s ship do while being shielded? This will allow new probes from Expanded Probe Launcher. These new probes or ‘flairs’ will allow the FC to launch customized smoke and flares into space using the same 3D interface used for the new super weapons and drones. These can use the new firework tech to create different points that can be used to identify, distract and coordinate larger efforts. It is possible that these flairs may even be warpable, allowing you to project a warpable target a short (50km or so) distance. Because they are probes, they can be repositioned and brought back in. Perhaps the fighter interface could also be used to identify and customize the probes. All of this package will keep our FC’s in the fight, only to leave them stranded and vulnerable if they fail. It allows for moves and countermoves and most of all unlocks whole new ways to play and look at the game. I am confident these simple tools could be used to allow FCs, or dedicated Control and Signal personnel to communicate and coordinate the fleet. To close I have one consideration that may be a problem. When an FC dies, it is often a terrifying moment, but in that moment heroes are made. Less experienced, or confident leaders are forced into action and often great FC’s are first identified because of this. There is concern that by making it easier for the FC to survive the fight, that Jr. FC’s will have less reason to step up. I think this is the kind of issue that the playerbase will just have to adapt to and that a better fleet experience makes things even less pressuring to those who wish to step up into command.